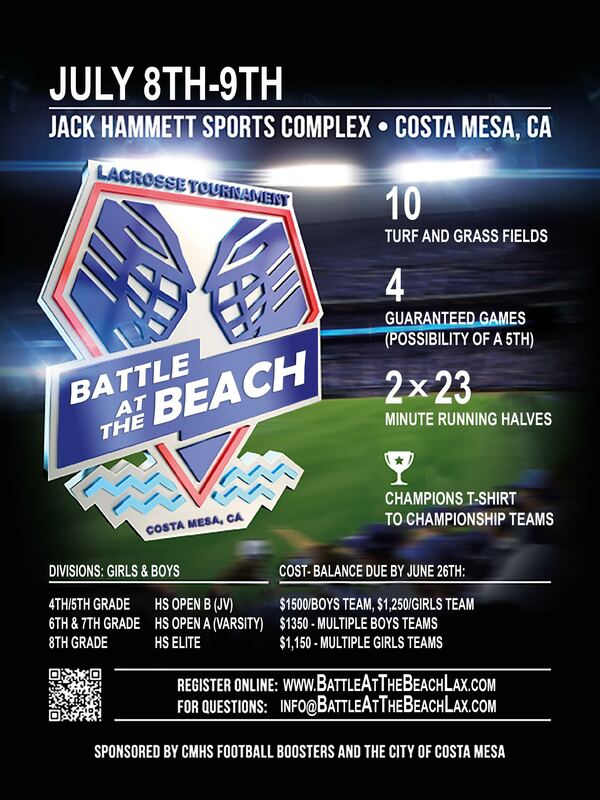 Orange County, CA (January 13, 2017) – It was announced that a boys’ and girls’ lacrosse tournament – Battle at the Beach – will take place at Jack Hammett Sports Complex and Costa Mesa High School in Costa Mesa on July 8th and 9th. Teams from up and down the west coast will be coming to Costa Mesa this July for a fun-filled competitive lacrosse tournament weekend. Only ten minutes from Newport Beach and Huntington Beach, this tournament is the perfect set up for the summer lacrosse season. look to build off of the momentum and fine tune the event for an even more successful and competitive atmosphere in Costa Mesa”, said tournament director Johnny Rodriguez. Why Battle at the Beach? Each boys team registration will be $1,500 and girls team will be $1,250 to compete. Multiple team discounts are available at a discounted rate of $1,350 per boys team and $1,150 per girls team. A $100 off early-bird discount special is also available and ends March 1st. Please contact us for the discount code to apply at registration. The Battle at the Beach will be an annual event only a few miles from famous California beaches in a perfect location for local and out-of- town teams. The City of Costa Mesa and the Costa Mesa High School Booster Club are great supporters and partners of this tournament’s success.